The New Black...Is In Your Plate! A troll came visiting today from distant Norway. My blog-friend, RennyBA, had sent him my way! Renny is a prolific blogger and a strong believer in the power of social networking and the Internet: He blogs about life, food and culture of his country, Norway. He even met his wife online, and his blog was recently rated as among the top three European blogs of 2007. 1. 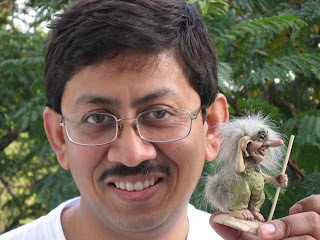 Trolls have long crooked noses, only four fingers and toes on each limb, and most of them have a bushy tail. 2. Trolls live in the icy mountains of the North, and only come out after sunset. Sunlight makes them crack or turn into stone. 5. If you keep them happy, they can make your livestock yield much milk and get fat and sleek. That's why people put a bowl of porridge in the barn for them during Chistmas Eve. Alrighty then. That should keep you safe when you visit the icy North on your next Norwegian trip. Thanks, Renny for the wonderful gesture! Thanks also for your compliment. Yes, I do believe in networking and meeting you is an example of its advantages. 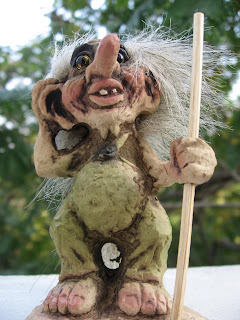 Norway is also the home of many tunnels for roads and motorways, and tunnels are a prime habitat for trolls. Many thousands of trolls are displaced every year due to man's requirements for new tunnels and are re-settled in less favourable habitats! Unfortunately, this is the unsightly side of the Norwegian news that never makes the foreign press. P.S. Pune District is the same polulation asNorway! Cool eh! @beaverboosh: Welcome to my blog! Thanks for the additional info on trolls. Ha ha, yes that's India for you: heavily populated everywhere!